I laughed so hard I had a major coughing fit for the rest of the evening. But man, it was worth it. Here’s a scene with Lance Armstrong I thought was pretty good. I caught a cold. Yuck. The green mucousy gross in your chest can’t talk or sing (ACK) kind. I must get rid of it by Sunday. Planina is singing at the Taste of Colorado and I really want to perform. Urg. Because I am sick, I pretty much passed out on the couch while the kids (TV zombies) watched cartoons. Sadly, I dreamed I was sick. So much for my imaginative subconscious. In my dream, I couldn’t breathe so I woke up (in my dream) and my mom was there telling me it was ok. Then I really woke up. And was sad. Read into that, huh? Heh. Ok. I’m not really angry. Actually I feel just fine. Had my first radiation treatment today. I got to sit in the special “Gowned patient waiting room”: James Taylor playing in the background, donuts and coffee available, assorted books for reading. The windows look out on to the Serenity garden (which actually just makes me think of Firefly, but I’m weird that way.) So I sat in my breezy hospital gown waiting for my turn in the machine. I’ve been so lucky, the nurses and therapists are wonderful here too (see entry on awesome chemo nurses). So I lie down in my Grecian pose and the machine lights up, putting crosshairs on my notaboob, just like David Banner’s head. As I’m lying there trying to pretend that my skull is glued to the board so I don’t move, I have the Incredible Hulk theme playing in my head. And then just to change it up, it’s the walking away theme. I probably dated myself with that one, huh? So back to the radiation. Basically there were some whirrs and clicks and I was done. I feel pretty good. Haven’t actually been angry yet to find out if my notaboob grows bigger, stronger and green. Ok. So it’s nothing like that. But wouldn’t it be cool if it were? Ugh. I hate sewing on buttons. So I went to the Radiation Oncology dept of the hospital all ready to get my new flashy tattoos (OK. They’re tiny blue freckles. But we can pretend that they’re cool.) and found out my CT scan was crooked. It placed my heart right smack in the field where they were going to radiate, which is no good. After two more scans it was determined that it was not the scan that was out of whack, it’s that I’m actually crooked. When you lie flat, your sternum is supposed to be directly above your spine. Apparently, mine is slightly off, which means in order for it all to line up correctly I actually have to lean slightly to the left, with my arm up in the air and my head turned right to look over my shoulder. Very comfortable. If you’re posing for a Grecian vase that is. Figures. I get my tattoos tomorrow and rads start on Wednesday. Woo. Um. I forgot to post the Friday Feel Up last week. I was singing in Bulgarian. Anyway, so you’re not off the hook. Go check ’em out. If you need incentive, go visit here. And watch this. This is for all of us. Not just the pink ones. 1 in 2 men will be diagnosed with cancer this year. 1 in 3 women will be. The money raised from Stand Up to Cancer will go for research that the government doesn’t want to pay for. Check out the link on the side bar. A donation as little as a dollar helps. There’s a place on the website to add a star for someone you know who was diagnosed with cancer. I’m going to add a few for my friends and it will only cost one less Starbucks coffee. Out! Out, damned pop tart! Ever have one of those weeks where it just feels like the universe is trying to tell you something? Yesterday, the heat element went out on one side of our very vintage (think ’70s) toaster. This happens, of course, right after a conversation with my MIL about how long our toaster has lasted. I really do know better than to tempt fate, but there it is. While I was fishing the half frozen waffle out of the toaster, I thought to myself, “There really is too much crap on the side of our refrigerator. If something were to happen to the toaster, it could be a problem.” Of course, once again with the fate tempting, I did nothing about it. Today, I completely forgot about the broken toaster. It’s plugged in behind the refrigerator or I would have unplugged it immediately yesterday. Dearest L, who I can rarely get to eat breakfast, wanted a pop tart (the organic kind, of course. I am European after all. Heh.) and so jumping on that, I dropped one in the toaster. I quickly went to brush my teeth (we were running late for reasons which I may post about later.) and smelled smoke. Thinking it was only the crumbs burning in the bottom of the toaster, I went to the kitchen to find it on fire. Yes on fire. 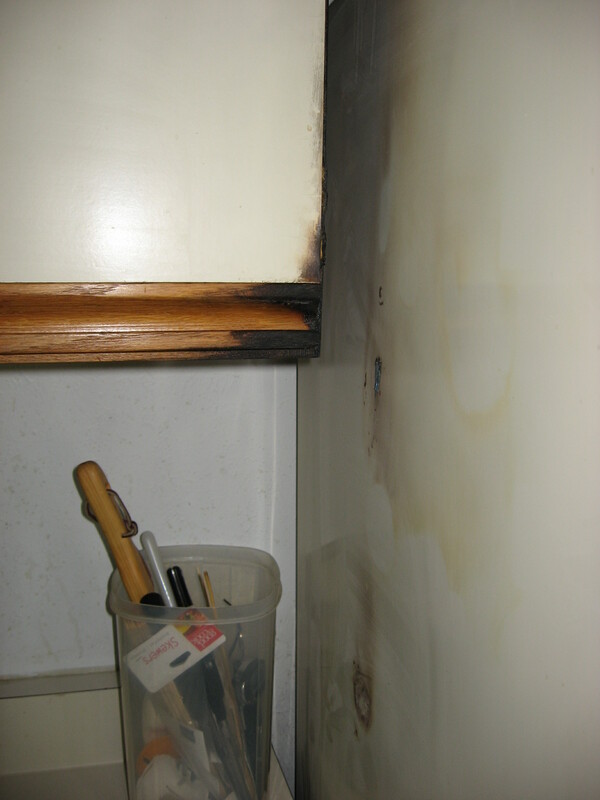 Grabbing the closest coffee mug, I doused it with water, but not before the toaster, the pop tart, all the crap on the side of the refrigerator, some of the things on TOP of the refrigerator and the outside of a cabinet were all burnt. Here is an after picture. Check out the beautiful scorch marks! I wish I’d taken a before picture. It was not pretty. Luckily the remaining damage is only cosmetic. So. Lesson learned this week? When that little voice inside your head talks to you? Listen to it. Darn it.